Monitor services and websites (see below). 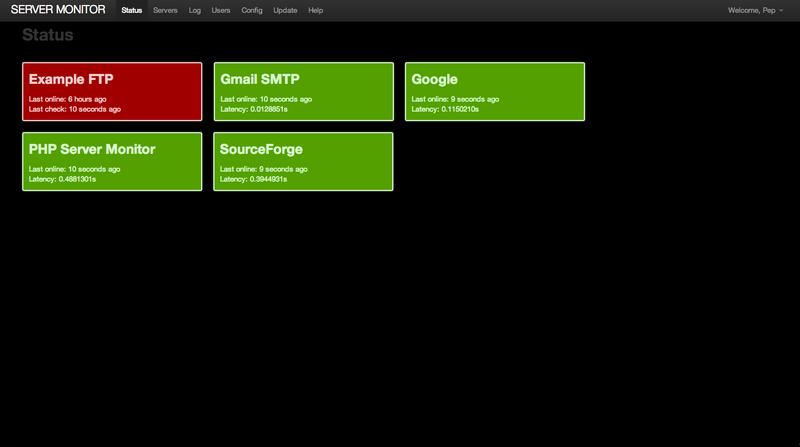 Email, SMS and Pushover.net notifications. 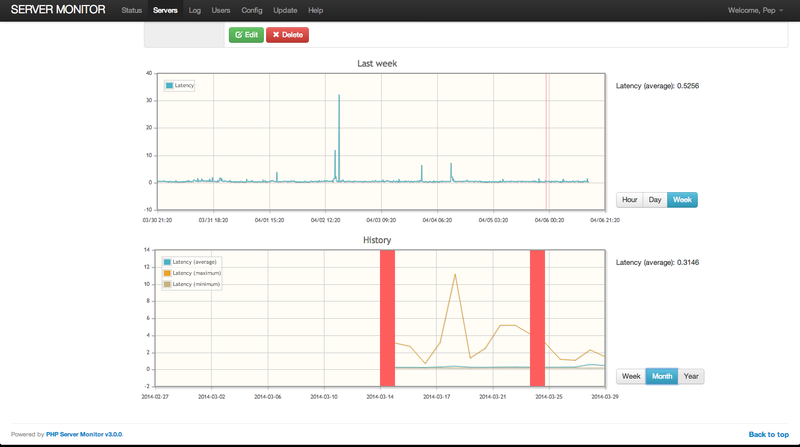 View history graphs of uptime and latency. User authentication with 2 levels (administrator and regular user). Logs of connection errors, outgoing emails and text messages. 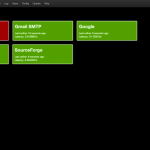 Easy cronjob implementation to automatically check your servers. A connection will be made to the entered ip or domain, on the given port. This way you can check if certain services on your machine are still running. To check your IMAP service for example, enter port 143. You can enter a link to a website (for example http://sourceforge.net/index.php), it will use cURL to open the website and check the HTTP status code (see http://en.wikipedia.org/wiki/List_of_HTTP_status_codes for details). If the HTTP status code is in the 4xx range, it means an error occurred and the website is not accessible to the public. 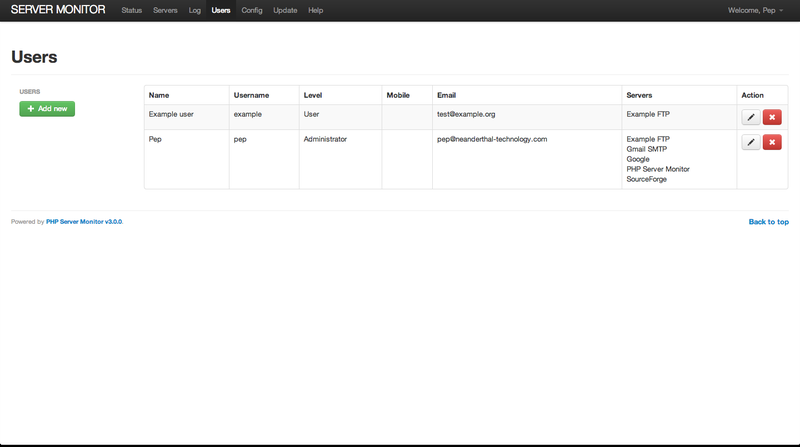 You can also set a regular expression to match certain content on the page itself. If the regular expression returns no matches, the website is considered down. In both cases the script will return a “status offline”, and will start sending out notifications. Each server has its own settings regarding notification. You can choose for email, text message (SMS) and Pushover.net notifications. Please note: for these gateways you will need an account with sufficient credits. If logging is enabled in the configuration, it will log any connection errors, emails and text messages sent. The latest log records will be displayed on your web interface. 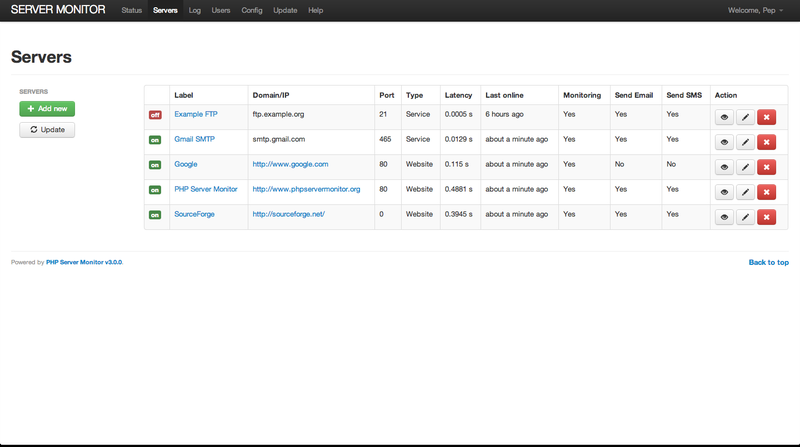 The cron/status.cron.php can be added as a cronjob which will keep the server status up to date. The latest version can be found at here. If you want to contribute to this project, you can clone the repository from Github here. 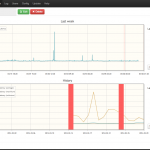 PHP Server Monitor is free software: you can redistribute it and/or modify it under the terms of the GNU General Public License as published by the Free Software Foundation, either version 3 of the License, or (at your option) any later version. PHP Server Monitor is distributed in the hope that it will be useful, but WITHOUT ANY WARRANTY; without even the implied warranty of MERCHANTABILITY or FITNESS FOR A PARTICULAR PURPOSE. See the GNU General Public License for more details. You should have received a copy of the GNU General Public License along with PHP Server Monitor. If not, see http://www.gnu.org/licenses/.